It only takes one person to make you happy and change your life: YOU. I am endlessly fascinated by the link between the way we choose to live our lives and the happiness we enjoy on a daily basis. There are choices that you make every day, some of which seem completely unrelated to your happiness, that dramatically impact the way you feel mentally and physically. Over the years, through our coaching practice and premium course, Angel and I have literally spoken to thousands of people who are struggling to find happiness in their lives. And what we’ve found is that it usually isn’t what you have, where you are, or what you’ve been through that makes you happy or unhappy, it’s how you think about it all and what you do with it. In our day-to-day lives it’s easy to miss the forest for the trees and completely overlook some of the small, simple things that can disproportionally affect our levels of happiness and general fulfillment in life. Luckily, you don’t have to figure it out all by yourself. 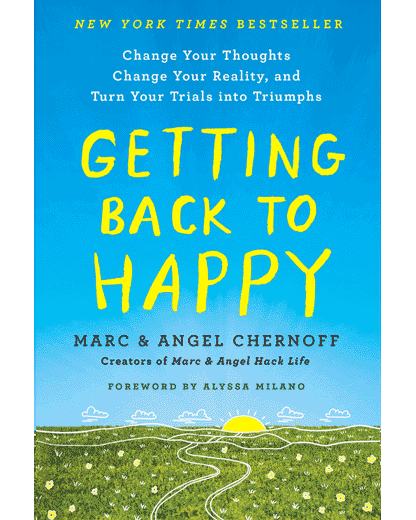 Angel and I have spent the better part of a decade working one-on-one with our coaching clients and finding the right habits and behaviors that support sustained happiness. Below, I take a quick look at some of the more actionable tips that can be easily worked into your daily routine. Start learning to be more human again. – Gadgets are great, but they can get in the way if you aren’t careful. Control them so they don’t control you. In other words, put down the phone. Don’t avoid eye contact. Don’t hide behind a screen. Ask about people’s stories. Listen. And smile together. Start filtering out the noise in your life. – Be careful about who you give the microphone and stage to in your life. Don’t just listen to the loudest voice. Listen to the truest one. Start choosing differently, for your own well-being. – A big part of your life is a result of the little choices you make every day. If you don’t like some part of your life, it’s time to start tweaking things and making better choices, right now, right where you are. Start dedicating time every day to meaningful activities. – What you do every day matters, but WHY you do what you do matters even more. So quit doing just what you’re able to do; figure out what you were made to do, and then do more of it. And if you only have fifteen minutes a day to spare, no problem – make those fifteen minutes meaningful. Start replacing your worries with positive actions. – Most of the things I’ve worried about didn’t happen. Most of the things I’ve hoped for and worked hard for did. The same is true for the happiest and most successful people I’ve talked to and worked with over the years. So keep dreaming and keep DOING. Start running toward things, not away from them. – The best way to move away from something negative is to move toward something positive. Start letting your love overpower your fear. – There are only two energies at the core of the human experience: Love and Fear. Fear pushes what you want away from you. Love draws it in. Start doing what’s right, even if it’s not the easiest option. – Just because you can, doesn’t mean you should. Just because it’s easy, doesn’t mean it’s worth your while. Do what’s right, not what’s easiest right now. It’s a less stressful and regretful way to live in the long run. Start comparing yourself to yourself, and no one else. – Forget what others have and where they are. You’re not walking in their shoes, and you’ll never comfortably walk in your own if you keep comparing yourself to them. So focus on what’s best for YOU and your unique circumstances. What do you need to do next for your own objectives? Do it! You won’t be distracted by comparison if you’re captivated with purpose. Start genuinely being happy for others. – The more beauty you find in someone else’s journey, the less you’ll want to compare it to your own. Start being more tolerant of those who see things differently. – Remember, love and kindness begets love and kindness. The way we love people we disagree with is the best evidence of what we really believe about ourselves. Start letting grace have the last word. – We’ll only lose the arguments our pride insists on winning. When it’s more important to win arguments than love people, we need to start all over again with our faith and priorities. Start being the difference you want to see in the world. – Honestly, you were born with the ability to change someone’s life. Don’t ever waste it. Be kind. Be present. Be someone who makes a difference. What you give to another person is really what you give to yourself. When you treat others with love, you learn that you are lovable too. Start SHOWING your loved ones what they mean to you. – Our closest relationships are vital to our happiness. As we tell those we love that we love them, we must never forget that the highest compliment is not to utter words, but to live by them. Start being grateful for the life that is yours. – Gratitude is simply the awareness of what’s good. Count your blessings, no matter how small, and start with the breath you’re taking now. Start replacing the phrase “I have to” with “I get to” whenever you catch yourself starting to complain. – So many activities we complain about are things others wish they had the chance to do. Start opening up to new growth opportunities. – In almost every situation, a little more willingness to acknowledge that there may be something you do not know could change everything. Go somewhere new, and countless opportunities suddenly appear. Do something differently, and all sorts of great new possibilities spring up. Keep an open mind and have fun with life. Start letting little frustrations go as soon as they arrive. – You can’t let one bad moment spoil a bunch of good ones. Don’t let the silly little dramas of each day get you down. Happiness starts on the inside. You control your thoughts about everything. Meaning, the only person who can hurt your happiness in the long run is YOU. Start focusing only on what you can control. – Never force anything. Give it your best shot and then let it be. If it’s meant to be, it will be. Don’t hold yourself down with things you can’t control. Start embracing the lessons life is teaching you. – Everything that happens helps you grow. Sometimes painful experiences teach us priceless life lessons we didn’t think we needed to know. If you’re having problems, that’s good. It means you’re making progress. The only people with no problems are the ones doing nothing. Start measuring your progress every day, no matter how small. – You are a work in progress; which means you get there a little at a time, not all at once. You may not be where you want to be yet, but look how far you’ve come, and be grateful that you’re not stuck where you once were. Start embracing the uncertainty in front of you. – Don’t let not knowing how it’ll end keep you from beginning. Uncertainty chases us out into the open where life’s true magic is waiting. Today, I hope you will have a delightful day, that you will dream boldly and dangerously, that you will make something that didn’t exist before you took action, that you will love and be loved in return, and that you will find the strength to accept and grow from the troubles you can’t change. And, most importantly (because I think there should be more kindness and wisdom in this crazy world), that you will, when you must, be wise with your decisions, and that you will always be extra kind to yourself and others. What would you add to this post? What’s something you do on a regular basis that has helped you find more happiness in life? Leave a comment below and share your thoughts. Such a lovely concept! Makes the difference between choosing to be a victim of something or learning from it. Something similar happened yesterday. My bike’s accelerator cable snapped while I was leaving from home. My friend said I had bad luck. I said it was great luck because it happened close to home and not on a bustling highway. One of the primary reasons I read both your blog and your book, is to alleviate my attachments to various expectations that have been driving me and my husband nuts for far too long. To live with less expectations is how I have found more happiness. One of my favorite reminders: “Is it sweeter to get what you expected or sweeter when you didn’t expect, and received?” I now understand that having too many expectations is spending too much of my time in the future and not enough time in the present. I work at this daily. Thank you for all the lessons. Great post filled with simple ideas that work. I’ve mentioned some of this before on previous post on increasing happiness, but I wanted to reiterate. What I have learned during my life is that, to a degree, we have to go against this world. Because if we follow every little thing that society has told us is the correct path to follow, we will likely not succeed or find happiness. So many of us are only focused on making money and chasing the dream it buys. This model works for some people, but sends many of us into a tailspin of confusion and depression. We spend all our time chasing things, and not enough time enjoying what we have. Happiness is not about having the latest in cellphone, car, appliances, TV, a perfect looking significant other, etc. Happiness comes from the little things, like a sunshine filled day, the sunrise and sunset, a marvelous landscape, a great conversation, the taste of a fresh fruit, a healthy body, etc. And this in one of the reasons I fell in love with your blog, book, emails, etc. – much of your writing reminds me that happiness and success is not found in excess, but in simplifying life to focus on the essentials. What I’ve learned is that negative thoughts, words and attitudes create negative and unhappy feelings, moods and behaviors. When the mind is negative, poisons are released into the body which cause unhappiness and even more negativity. This is the way to failure, frustration and disappointment. Positivity is the only path forward. These tips were truly helpful. I practice a lot of them, but it’s great to be reminded of why. Reversing my thought processes, and focusing on what I have and knowing that I cannot be the fixer for people I love (I can love them). This has helped me find more happiness. Particularly during this season with expectations and eclipsing thoughts of past traditional ways to celebrate, I appreciate your reminder to find my own center. This is MY life, to enjoy and share freely. I loved the point that ‘not everyone has the heart you have’. Seeing these words in print helps put me at peace with this reality so that I don’t struggle with it any longer. The hardest lesson for me has been to realize that happiness cannot be bought or sought it really does come from within. Realizing that the universe isn’t against me when problems come at me..it is helping me to stretch and get out of my comfort zone in order to really experience life and something new everyday. Something I do everyday that makes a difference in my life is ‘smile’ at strangers who I encounter in my comings and goings. It’s contagious and it feels wonderful! Thank you for another great post. With the new year fast approaching this is a great guide to help me get my life in order and lead a more successful and happy 2015. Everyone will be applied to my life because 2015 is my year and I do not want to ever loose site of what is important. Beautiful advice, I reread that line several times to let it sink in fully! David, would your rather have your expectations of others met, or your dreams fulifllied? I would add that people need to get to the “Enough is Enough” moment. Where they finally accept the truth that they are practicing “Wrong Thinking” or they wouldn’t continue getting wrong results and switch to “Right Thinking”that proves it self by producing “Right Results”. Lovely post you have there. Having cars, boats or vacation homes are nice possessions to acquire, but it’s often just the little things that makes life worth wild. It’s not the objects that makes life great and yet, some people believe a simpler life involves buying things no one else could afford. I just wanted to share with you that these 27 ways are very effective and I’m most likely going to start applying the method of measuring my progress from a day to day basis. Never look at the big picture and focus on each segment at a time. Some lovely thoughts and reminders at this time of one year moving into another. Making next year a year of meaningful, human connection, full of ‘relationship wealth’ seems like a great ambition and a good touchstone reminder for the year. Thanks for the ideas and wishing you a wonderful holiday season. In a eulogy of Zachary Taylor(12th POTUS), President Ab Lincoln said ” The Presidency is no bed of roses”, actually, life in general is no bed of roses which was why Thomas Jefferson said in the Declaration of Independence “pursuit of happiness” knowing the happiness is elusive. I wonder how did Big Tom know the happiness can not achieved, perhaps from life experience. Does that mean quitting is an option? Absolutely not. Churchill once said “If you are going through the hell, keep going”, “Never, never, never give up”, he wrapped it up. I have been trying to tell this concept to people including my family, but the wording never really seems to come out precisely right. It’s all about expectations of others really. The trouble is, you cannot control another person, and they have the right to make mistakes and learn from them, or even not learn from them and continue to fail. They have that right as a grown person. It’s okay to be helpful but not try to pin who you think they should be, or have the capacity to be on them, because it’s not fair. We should want the best for them, we should be there for them, but never expect anything from them. Hopes are fine, but when we’re disappointed with what someone has done, we are the ones to blame. If we didn’t have expectations for them to meet that they cannot live up to, we wouldn’t be let down. It’s time to remember why we love the people closest to us in the first place, regardless of the choices they make. Our high standards are our own, nobody else should have to suffer because they don’t live up to them. THAT is huge in terms of happiness. Having Low expectations is rewarding more than having high expectations and then things turn upside down. Nothing like playing through a flow, bouncing over a trail or cruising through an open field along with your friends. You’ll still obtain a joy whenever you set up your motorcycle each morning even although you acquired your ATV like a work appliance. Always treat people the way you would like them to treat you. Even if some of them don’t return the courtesy, at least you have tried to make a difference. Thank you for this beautiful list. It was absolutely splendid to read and couldn’t agree more. Should one truly care to obtain happiness, follow 5 of the 27 items of this list and well-being will be yours. One of my own favourite thoughts & which I am very conscious is that I am truly Grateful; for what I have & achieved in my life! beautiful post !! thanks for sharing !! Thank you for articulating a very motivating concept on Happiness . Your post summaries three important behavioral pattern worth forming as habit ; being humble, modest and simple. Happiness will consequently follow. I would add one action that is, initially, less emotional than those listed here. That is, take care of your body. Wellness and fitness lead to greater clarity of thought, improved physical health, and a general sense of well-being. Armed with these, we are better prepared to deal with the challenges of daily life and to recognize the blessings that come our way. A potential life-changing article. I’d recommend converting the items to checklist as progress indicators to be checked off each day, week or at an interval one is comfortable with. How we live our life can be a checkable series of events against these issues, whether as accomplishments or targets to be achieved. This article was a great reminder of how we’re in control of our happiness. I recently journaled about what’s next on my life’s journey. I want to make sure that I’m doing what I feel is best and not what someone else feels is best for me. I’m learning the art of sitting silently and letting the answer come. Thank you. Another awesome article from you guys! I love reading your posts, they are always very encouraging and motivating. Continue doing a great job. Thanks for sharing. Very nice. I have a Gratitude Jar and make regular deposits in it. Sometimes if I am feeling a bit off, I will spot it add add a few items. I always feel better then. What I’ve found is that a lot of being happy is about your attitude toward the past, the present, and the future. If you can be accepting of the past, present in the present, and hopeful for the future, then being happy will be much easier. If you’re missing one of those key components then it will be very difficult to find your happiness. Great post, as they all are. Looking forward to more. Everyone, as always, thank you for sharing your kind remarks and insightful thoughts with us. Beautifully stated. Happy is my focus word for 2015 as I am sitting down to reflect on 2014 and plan for the year ahead. Your article is perfectly timed! Choosing any one of these as a focus for a day would make a difference by the end of the year. Marc and Angel, Happy New Year! Thank you for the millions of words you write that change lives. In your post today, number 1 said “start learning to be more human again.” I’m so glad that was number 1 because as a writer, I can easily isolate for hours and pretend that posting on social networks is the same as having human contact. I need to start building breaks into my work day for human contact. Thanks for the reminder! Start being the difference you want to see in the world. This difference is often a passion and it allows followers to see and experience that passion. Passion is what makes great leaders! When someone does something foolish and I start to get angry, I imagine that they must be having some bad circumstances in their life to cause this behavior and I find sympathy rather than anger. I look around and see the reaction of others to this action and I decide that if I meet that person with an equal reaction, I am letting them control me and I will create the same reaction. In the end, nothing is better. Thank you. Thank you for this. I’m going through a very tough time in my life in almost every area and this really made me refocus my attention on things that actually matter like a cup of tea or getting/giving a long-awaited hug. It’s one thing to tell yourself to just be more positive and another to see a handful of well-stated how’s in front of you. Some of these will need to be sprinkled on the walls, I think. Such a sweet article that shows us what we can do to be happy. Very inspirational. I have just started paid work after a long while unable to work because of mental illness. It is all thanks to your daily feeds on my Facebook page. I am so grateful. When I have a bad day I turn to your posts and remember how to think positively and be grateful for what I have. I am still working on confidence, it’s a daily struggle that I need reminding of every day. Thank you both for being there. Thank you for the wonderful guidance you share. It always brings me brevity.